ADX staying below 20 level — there is no trend or the trend is weak. ADX moving above 20 level — trend is strong. ADX passing 40 level — trend is extreme. ADX value rising — trend is going stronger, falling — trend is weakening. +DI stays on top of -DI — uptrend is in place. -DI stays on top of +DI — downtrend is in place. Two DI cross — trend is changing. In other words, ADX advices on trend tendencies: whether the trend is going to continue and strengthen or it is about to lose its positions. ADX indicator has 2 lines: ADX itself (white), +DI (green) and -DI (red). Traders then need to draw a horizontal line at the level of 20. All readings of ADX which are below 20 suggest a weak and unclear trend, while readings above 20 indicate that a trend has picked up. That is, basically, the simplest explanation of the purpose of ADX. ADX allows Forex traders to determine whether the trend is strong or weak and thus choose and appropriate strategy to trade with: a trend following strategy or a strategy fit to consolidation market periods with no significant price changes. There is also additional line to be added to ADX indicator window - at 40 level. If ADX is traded below 20 - there is no trend or the trend is weak, thus a non-trend-following strategies should be used, otherwise losses may occur as a result of false signals and whip-saws taking place. An example of non-trend-following method is channel trading. If ADX is traded above 20 but below 40, it is time to apply trend following methods. An example would be: Forex trading Moving averages or or trading with Parabolic SAR indicator. When ADX reaches 40 level, it suggests an overbought/oversold (depending on the trend) situation on the market and it is time to protect some profits of at least move Stop loss order to a break even. When ADX passes 40 level, it is a good time to begin collecting profits gradually scaling out of the trades on rallies and sell-offs and protecting remaining positions with trailing stops. ADX -/+ DI lines are used for spotting entry signals. All -/+ DI crossovers are disregarded while ADX remains below 20. Once ADX peaks above 20 a buy signal occur when +DI (green) crosses upwards and above -DI (red). A sell signal will be the opposite: +DI would cross -DI downwards. If after a newly created signal another opposite crossover happens within a short period of time, the original signal should be disregarded and position protected soon or closed. ADX indicator is never traded alone, but rather in combination with other indicators and tools. ADX indicator most of the time gives much later signals comparing to faster reacting moving averages crossover or Stochastic, for example, however, reliability of ADX indicator is much higher than for other indicators in traders' toolkit, which makes it a valuable tool for many Forex traders. When ADX rises above 20 for the first time and then goes flat for some time, there is believed to be a new trend being born and the reason for ADX being currently flat is because market reacts to this new trend formation by making first initial correction. During this correction it is a good time to initiate new orders. what settings can one use for the ADX in trading short term trades, like the 30min time frame? ADX indicator standard setting are 14. In most cases it is better to use standard settings just because majority of traders use them; result - everyone sees the same picture and gets the same signals at the same time. However, with ADX indicator specifically, Forex traders often look for alternative settings. The nature of ADX indicator allows experimenting with settings to get best performance. Common range for ADX is from 7 period ADX to 30 period. For 30 minutes chart try ADX 30.
should i use ADX with the weekly, daily, or 15 minute chart? any chart, I use it even on 5 min as a trend filter for scalping here and there. will default settings for ADX (ie) ADX14 will suit trading on 15 Min chart? Yes, ADX comes with all MT4 platforms. 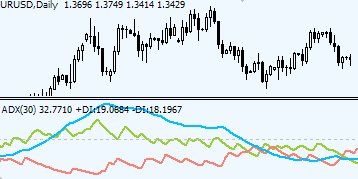 You'll find it in MT4 under Trend indicators, under name "Average Directional Movement Index". Found ADX useful, show sell signal... Google and found this page, short and simple. Thanks U Guys. ADX indicator is a good help but only with other supportive indicators like RSI or so. I agree with the rest of the traders, this site ROCKS! thanx for your explanations. they are simple n easy to understand. I will recommend this page to all my FX buddies, be blessed-Mightily. Google -> your site -> understanding :) thanks very much. I was searching long time for easy to understand explanation. It's great to have so many people discovering the powers of indicators! But double-check with other resources. I want to thank a friend for a novice not to have trading in the demo so real and yesterday I discovered your site. Quero agradecer ao amigo pois sou novato nao to ainda negociando no real so na demo e ontem eu descobri seu saite tenho apreendido muinto e embreve ja irei operar na conta real pois suas explicaçoes estao a me dar confiança obrigado mesmo e sertamente estarei de olho no seu saite ok. When a strong trend is in play and reverses to a strong trend in the opposite direction, what should we look to see in the ADX? If you wait for it to go back to 20 and rise above you have missed the strong trend in the opposite direction. How do you recognize this situation before it's too late? Thank you! When a strong trend is changed by an opposite strong trend, ADX indicator is totally useless. Basically, as soon as ADX starts to decline from the top 30-45 levels, it no longer posses any interest as it can't reflect a change in a trend. Traders can only refer to +-DI for trend confirmations.